The substantial collection of notations of seventeenth-century Ottoman instrumental music made by Demetrius Cantemir is both a record of compositions of considerable intrinsic interest and a historical document of vital importance, representing as it does one of the most comprehensive accounts of any Middle Eastern repertoire before the widespread adoption of Western notation in the twentieth century. 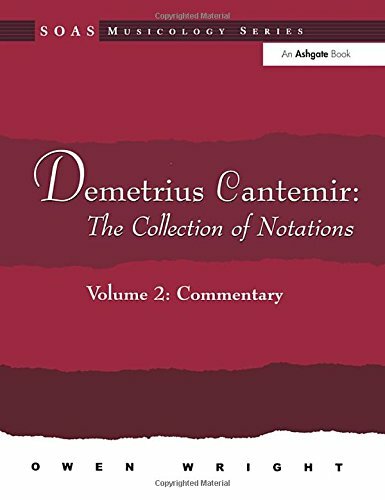 This volume contains a commentary to the edition of Cantemir's notations prepared by the same author. The introductory section provides a context for the collection, giving a biographical sketch of its compiler and relating it to the theoretical treatise it accompanies. This is followed by a substantial analysis of modal structures which examines each makam individually and then attempts to make progressively wider generalizations. The projection of melody onto the various rhythmic cycles is next examined, with particular attention being paid to the various formulaic elements which constitute much of the compositional language of the period. A final section shifts to a more diachronic perspective, surveying internal evidence for historical change and for the survival of earlier styles.